Queens kicked off their 2012-13 league campaign with a hard fought victory over Forfar this afternoon at a sun drenched Palmerston, as two pieces of clinical finishing was the major difference between the two teams, and following on from their opening two cup victories, Queens made it three successive competitive wins at the start of a season for the first time since the 1983-84 season,some 29 years ago. The inclusion of Dan Carmichael in place of Derek Young was the only change made to the team that started against Alloa, with new signing David Hopkirk given a place on the bench. Kicking towards the Terregles Street end of the ground, Queens again made a bright start to the game and might have taken the lead inside the opening minute when a cross from Derek Lyle found Dan Orsi at the far post, but his header was blocked away for a corner.The resulting set-piece was cleared away but only as far as Carmichael 20 -yards from goal and his attempted curling effort,although on target, was comfortably held by Forfar `keeper Soutar. Keen to take the game to their opponents, Queens were quick to get the ball from back to front as quickly as they could, and Lee Robinson emphasised this this on a couple of occasions in the opening spell with his early clearances setting up attacks using the pace of both Orsi and Nicky Clark,but unfortunately both promising opportunites were halted by blocks from covering defenders. The visitors replied by winning a couple of back to back corners, neither of which caused any problems for the Queens defence, and minutes later it was Queens again who created another chance to take the lead. Orsi collected the ball midway inside his own half and attacking at pace he escaped the lunge of Gibson and after exchanging passes with Carmichael, he delivered a cross to the back post that was just too high for Lyle to make any sort of decent contact with. Gibson was subsequently shown yellow for his foul. On 12 minutes Kevin Holt was yellow carded for a clumsy challenge just outside the box, and from the free-kick, Swankie`s fierce drive only just cleared the crossbar. 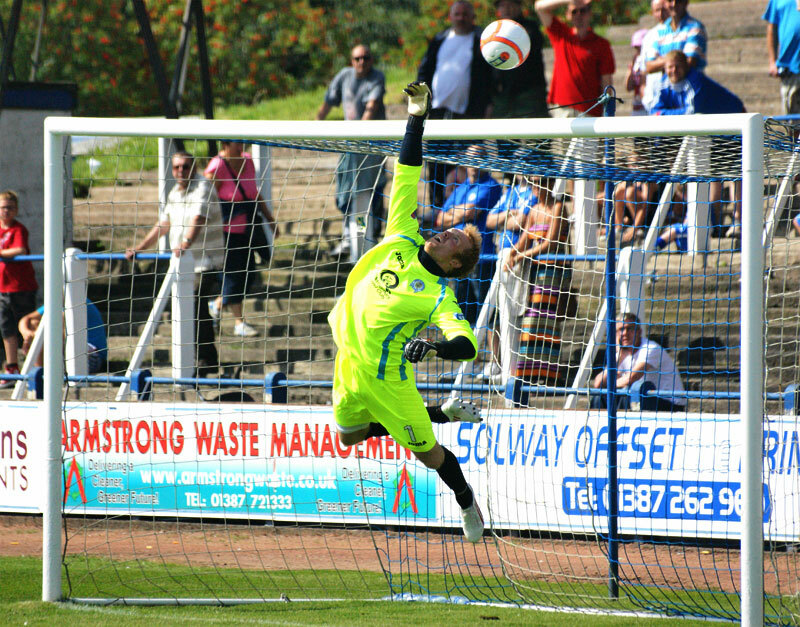 Queens continued to have more of the attacking play,and following a free-kick on the left a clearing header fell nicely for Lyle and the striker`s crisp shot produced a fine diving save from the Forfar `keeper. It was Lyle again who came close to scoring as he got on the end of Chris Mitchell`s driven cross, his half-volleyed attempt being deflected wide of goal for another corner. 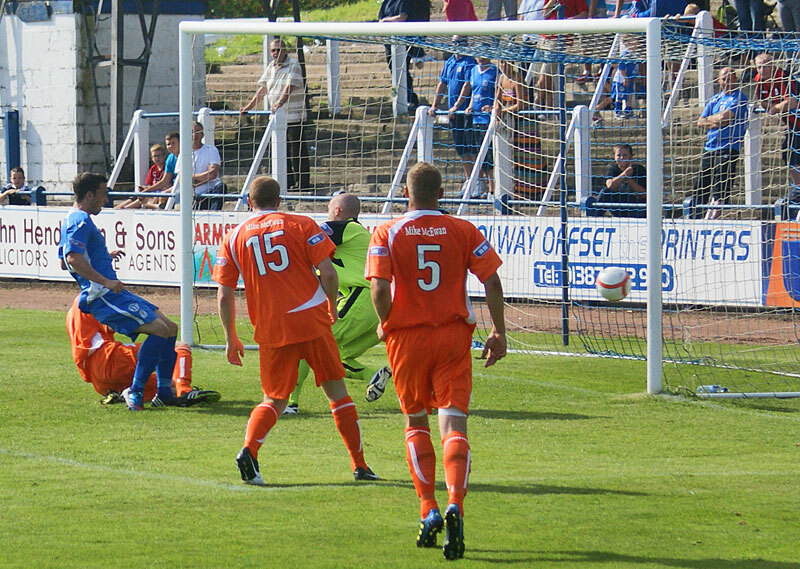 The half an hour mark of the game turned out to be the pivotal moment of the first period, After winning three corners in succession,Forfar might have taken the lead when Mitchell`s mis-hit clearance fell into the path of Campbell on the edge of the area, but lacking composure he hit his shot high into the terraces behind the goal, and almost straight afterwards Queens took the lead. Kevin Holt`s long ball from defence found Derek Lyle just inside the box and the striker showed good control and awareness to cut back across the defender and drill a shot past Soutar from 10- yards out. A second goal almost arrived a minute later when Lyle nearly got on the end of a long ball from defence, and as the Forfar `keeper chested the ball clear just outside the box it ran loose to Clark whose chipped effort was headed off the line and out for a corner. 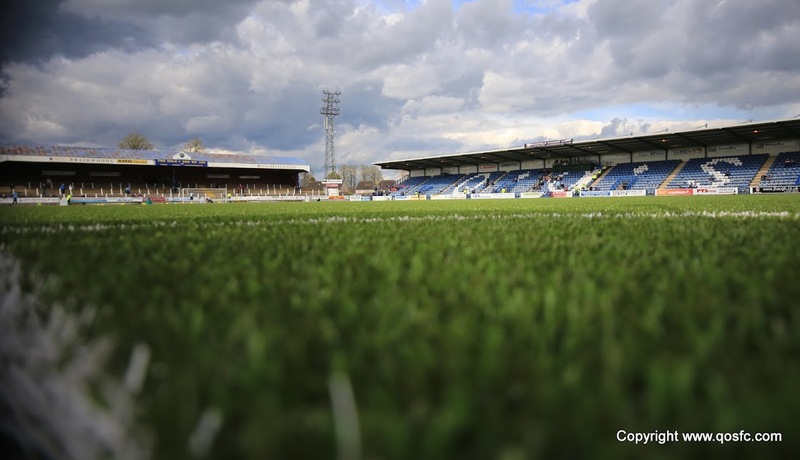 As the half neared it`s conclusion, Queens were awarded a free-kick 25 yards out after Clark was fouled, but Mitchell`s effort was poor as his shot went harmlessly over the bar. A decent enough showing from Queens in the first half, although falling short of last week`s opening period, they still created enough chances to be more than a single goal ahead. The opening phase of the second half was quite a scrappy affair with neither side being able to keep possession for any length of time, but Queens did have the better of the half chances in the early stages, and a Mitchell cross was met by a header from Clark as he peeled away at the back post, which was quickly followed by a break involving Clark and Holt that ended with a cross for Orsi to head only inches wide of the target. The half continued in a rather mundane fashion for 15 minutes or so, with Queens begining to sit back a little and their cohesion and fluency disappeared as the visitors became a bit more adventurous in attack, although in truth, Robinson was not really called upon to make a save of note. With 16 minutes to go Queens created their best opportunity of the half as Mitchell and Carmichael worked a good opening down the right and from Mitchell`s cross Clark smashed the ball against the near upright from close range. Dan Orsi then created a half chance for himself by jinking past two defenders before shooting high and wide, and then Queens introduced Gavin Reilly for the tiring Lyle. As the game entered it`s closing stages, Queens survived a bit of a scare when Templeman`s shot across goal was deflected wide for a corner. With just one minute of the game left, Queens finally wrapped the game up courtesy of a very well taken individual goal. Sub Gavin Reilly picked up the ball just inside the corner of the box and twisted one way and then the other before slamming the ball right-footed past the diving Soutar from an acute angle. The returning Dan Carmichael was named as sponsors man-of-the-match, and a crowd of 1245 saw Queens claim top spot in the division after this first league game, and three wins from three games has indeed been a very decent start. 14:34 Hi folks and welcome to Queen of the South v Forfar Athletic. 14:48 And today`s officials are led by referee Mike Tumilty assisted by Steven Reid and Gavin Thomson. 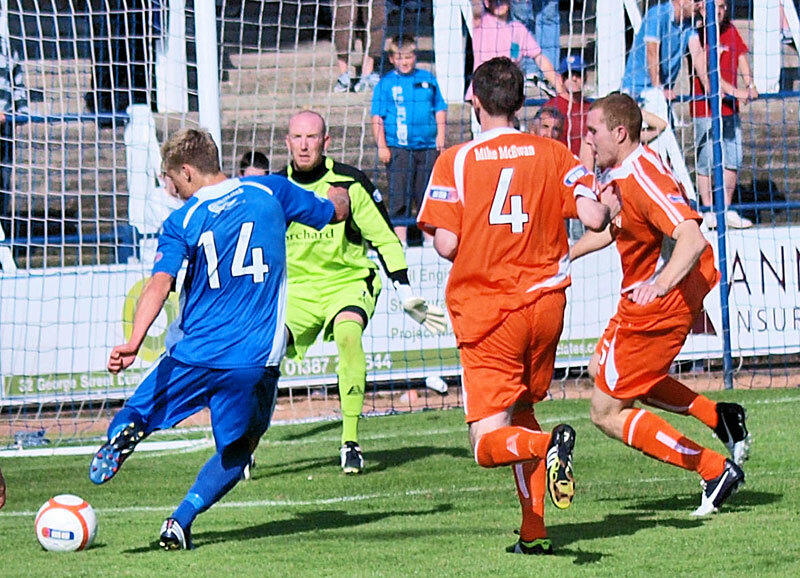 14:53 Queens hosted Forfar at the start of last season too, winning 3-0 with goals from Brighton, Johnston and Clark. Hoping for a similar result! 1 min First effort for Queens. Derek Lyle is fed down the channel and his cross finds Mitchell at the back post but his header deflects wide. 7 min Both teams have lined up 4-4-2 with the game pretty even so far. 11 min Good counter attack from Queens as Dan Orsi breaks from defence to cross from the byline but his cross is too high for Lyle. 12 min Yellow Card : Queens` Kevin Holt gives away a free kick 25 yards out and is booked. 13 min Gavin Swankie fires the freekick just over the Queens bar and at the other end Lyle`s low shot is blocked by the `keeper. 20 min Best chance so far. Chris Mitchell`s free kick finds Lyle free at the back post and his volley across the goal is sliced wildly behind. 29 min Forfar have subbed the yellow carded Keith Gibson for Mick Dunlop. Gibson was risk for a red card after a crude challenge on Nicky Clark. 37 min ... 25 yards but it`s headed out from under the bar. From the corner Higgins` flick is headed over by Clark from inside the six yard box. Half Time A strong first half performance from Queens gives them a 1-0 lead going into half-time. Half Time They`ve created some good chances going forward and had little problems defensively with Forfar`s greatest threats coming from set-pieces. Half Time The attendance today at Palmerston is 1245. Looks like most of them are liking what they are seeing. 53 min ... but his header flies over. 57 min Nicely worked attack from Queens as Clark plays a reverse pass for Holt to bomb on to and cross. He found Clark but his header goes over. 61 min Dodgy moment for Robinson in the Queens goal as he fumbles a cross under pressure from a Forfar player but he recovers. Danger gone. 75 min Clark hits the post! Mitchell fires in a low cross and Nicky Clark connects well bit hits the post. The ball cannons back and over. 76 min That would have made things a bit more comfortable for the home side. Need to press on now. 79 min Nice play from Orsi as he cuts inside but smashes his shot way over the target. 84 min Goalscorer Lyle makes way as Queens look to freshen up the front line and use Reilly`s pace. Lyle hadn`t really featured this half. 89 min Chance for Forfar. The ball falls to a Templeman but his low shot deflects wide. 90+1 min Quality goal from Reilly should put the result beyond doubt. 16:54 ...Reilly sent the Queens fans home happy with a cracking goal. Allan Johnston keeps his 100% record this season going.